With a minimum setup, you can boot the Raspberry Pi 3 by connecting the micro USB's PWR IN port with a computer's USB port (tested on a Mac and Windows). However, there can be an indicator that pops up on the monitor. If you see a small rainbow square in the corner of your screen, your power supply isn't powerful enough. With the release of the PIXEL image, the “lightning bolt” status symbol can show up. This also indicates that it is “undervoltage” [ Stack Exchange: Raspberry Pi - What does the lightning bolt mean? ]. For stability, we would recommend at better power supply. Try looking at getting this Wall Adapter Power Supply - 5.1V DC 2.5A (USB Micro-B) that is included in the Raspberry Pi 3 Starter Kit. The Pi 3 has a slightly different SD socket on it than previous Pi's did. The new sockets are not spring loaded like the old one and the feel you are describing is normal for the new socket. Rather than have a spring mechanism hold the card in place, the new socket uses friction. They definitely feel strange compared to older Pi's. If you would like to use node.js with raspberry pi's, you can use this: https://github.com/jalbam/nwjs_rpi They should work but require an older version of the node.js or NW.js webkit. It's an evolving project but the creator hopes to get it up to date with the latest versions soon. In case anyone doesn't already know, you need the latest NOOBS (version 1.9.0 or later) for the Pi3. You will get a gigantic rainbow square on your screen if you try an older version card. Make sure that you use the latest image from the Raspberry Pi foundation https://www.raspberrypi.org/downloads . As a note, sometimes the update through the command line interface does not work as effectively as manually re-imaging the microSD card. If you have not imaged a microSD card before try looking here => https://www.raspberrypi.org/documentation/installation/installing-images/. If you look at the specs of the Raspberry Pi 3, it requires a more beefier power supply compared to the previous Raspberry Pi models. There have been some customers that have issues booting on the Pi 3 but there is no issues with the Pi 2. After switching to a better power supply, they were able to get it to boot and not crash. Make sure that you have a sufficient power supply. The rainbow at the boot screen could be due to the image or the power supply. Try looking at the suggestions above. The microSD card slot is different from previous Raspberry Pi models. It does not have a spring to click the microSD card in or eject. This is normal due to the design of the new microSD card slot so that you do not accidentally eject your microSD card from the socket. It's a "friction fit feature"and not a "bug." If you are having issues removing the microSD card, try affixing a small piece of tape on the microSD card to act as a handle when pulling the memory card out. Try looking at this tutorial for using the UART on the Pi3 [ https://www.hackster.io/fvdbosch/uart-for-serial-console-or-hat-on-raspberry-pi-3-5be0c2 ]. I've got to agree with some of the others. The addition of the wireless communications is great! A bigger better faster CPU is great! But no more memory? Uhm???? You may want to note the location of the power and "disk" LED's has moved from their original positions. Until RPi3 cases come out, I'd recommend a clear Pi2 B case if you want to view the indicator LEDs. The RPi3 now boots Raspbian in about 15 seconds and shuts down within 10, a huge improvement. The latest 2016-02-26 Raspbian image now boots directly to a desktop with no installation procedure. One has to run raspi-config to expand the root file system and set the keyboard and locale, etc. Locale setup is now super clunky. I always forget the default setup is for the UK. Click on the funky icon on the right side of the top bar to configure the network. WiFi connected on first try. It took about 15 minutes to 'apt-get update' and then apt-get upgrade vi WiFi. Curious. Why the (almost) $40 instead of $35 for version 3? Basically so we don't lose too much money. Raspberry Pis are hard for resellers because we don't get any discount on them. We buy them from the supplier at $35, pay to ship them here, pay our guys to receive them, stock them, box them up and on many orders pay for free shipping. Truth is that $5 helps cover some of that, if we didn't add it we might not be able to carry the Raspberry Pi for you guys. YOU are bitching about $5.00?? my pi is being weird. when i boot 95% of the time it freezes or goes into a terminal kernel consle. the sd card works on my pi zero but not my pi 3. it was just working 2 days ago and now it is not. the power supply is 2 amps so it should be okay. i just hope i don't have to buy a new pi. I am using a fresh install of Ubuntu Mate, 16.04. Anyone have any suggestions? We were hoping for this week but we didn't have enough SD cards. Hopefully the SD cards will be in stock in the next couple of weeks and we can start shipping. In other words I'm trying really hard. If you don't want to wait you can also get the Accessory Kit and the Pi 3, or just find the individual parts from the kit since the Pi 3 Stater Kit has slightly different parts. I still greatly dislike the idea of having it powered via the (delicate) MicroUSB (prone to unplugging) which appears to have no other function, I'd rather have a barrel jack. Ethernet hasn't been upgraded to gigabit, and there's no USB3 either.. I guess that's going to come out in Pi 4. In a video I saw some time ago on the RPi3 they talked on an 'optional (possible) hack' to connect an external antenna and thus extend the range of the WIFI. Anyone know or tried this? This is a great little board. It runs fldigi and gnuradio well and is simple to setup with the 7" touchscreen and Raspian Linux. 2 things to note, bluetooth setup may be a bit convoluted, and so far I have found it impossible to get the wireless to connect to a hidden network. It works well connecting to wireless networks that broadcast their ssid. I had found instructions on how to connect to a hidden network but they didn't work and I didn't have time to troubleshoot further. I am very surprised at the computing power of such inexpensive little board. Do yourself a favor: Be sure you have a power source capable of 5V and maybe 2A. My 1.5A cell phone charger is barely enough to boot it up. I have found that I sometimes need to have all USB peripherals unplugged, and plug them in one at a time after bootup. Also, buy a stylus. Your finger tips are probably much too big to operate most software programs running on a 7" screen ;). With the bluetooth setup you may find that blueman does't work, in which case you may have better luck with a command line tool. I ended up having to uninstall blueman as it was interfering with the command line utility. 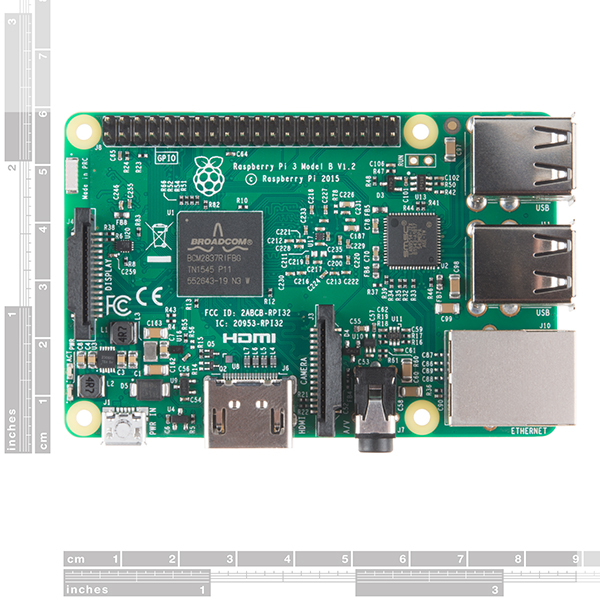 Is the Pi3 truly export controlled? There is no mention of this on the Raspberry Pi Foundation website or when buying from other US-based vendors. This wasn't an issue with the Pi2. To some degree yes. 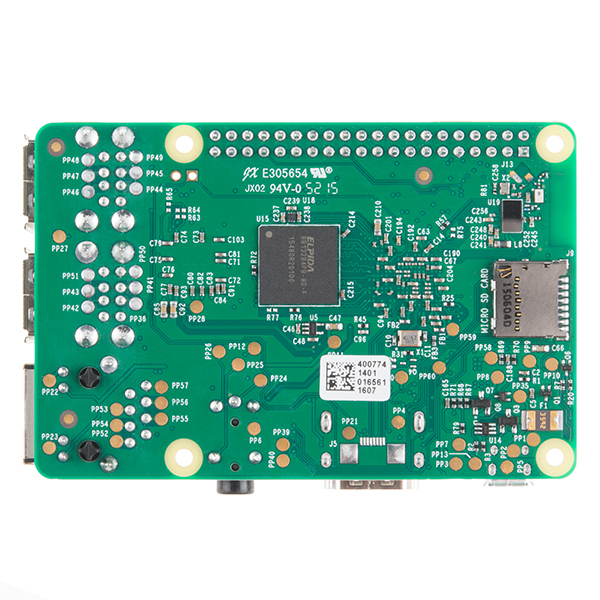 The Pi 3 has Wifi and Bluetooth which change the restrictions. I believe we will be able to ship the Pi3 to most places, but the customs information and declaration is different (and basically what we are waiting on). Billbo, I can confirm that some are shipping. I pre-ordered about 3 weeks ago. My pi shipped today (March 25). ETA on when we can expect to receive the boards to our warehouse is a moving target. We may get smaller quantities intermittently before the dates displayed, but we try to display the more reliable date for your planning needs, and update it as we get more information. will this run pure data right away??????? thanks! What version of BLE does is this support? 4.0, 4.1, 4.2? What is the BT chipset? Is it a dual-mode BT (i.e. BR/EDR and BLE)? I love the RPi, but I wish they would organize the connectors a little differently. Arranging the Ethernet, power and USB onto the same side would make it possible to use the device in a standard box when building embedded projects. 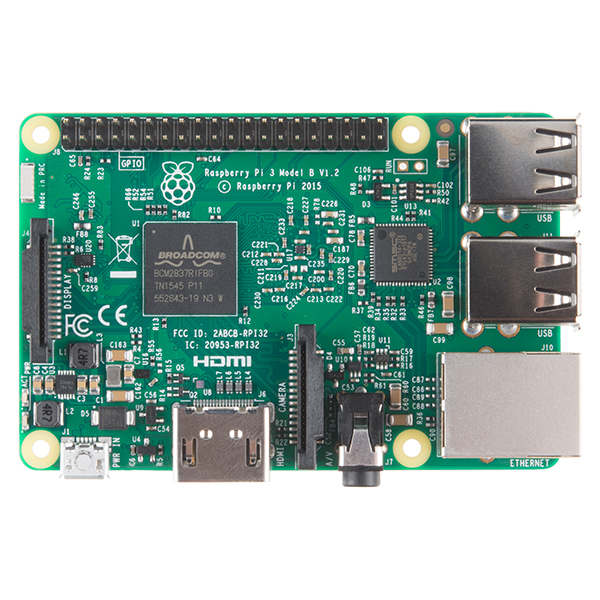 Will there be various other models of the Raspberry Pi 3, as we have seen with previous iterations of the Pi? What about Model A+? Model A+ continues to be the $20 entry-level Raspberry Pi for the time being. 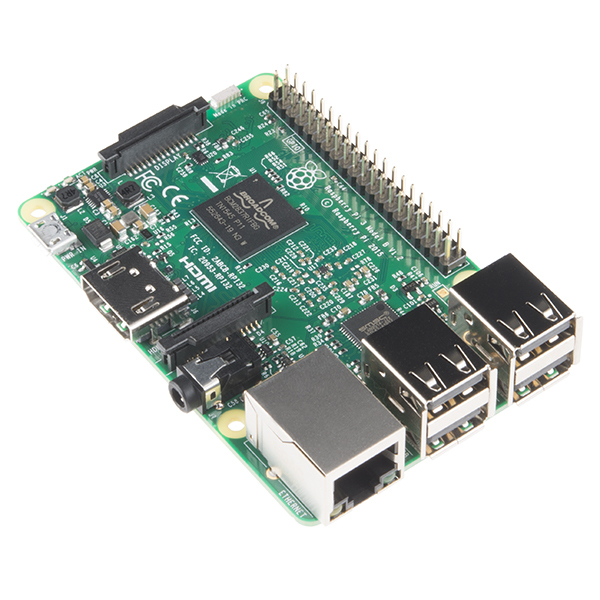 We do expect to produce a >Raspberry Pi 3 Model A, with the Model A+ form factor, during 2016. We don't know of any, but the Raspberry Pi Foundation keeps things pretty close to the chest until it is time to release them. If you had a suitable power supply I'd pre-order today. Sparkfun, are you going to put together a 'newbie' bundle for the Pi 3? We are planning on releasing a kit similar to the Raspberry Pi Starter Kit, but we didn't feel comfortable posting a preorder until we had a better idea of what would be in the kit. Once we get a Pi 3 to play with we can do some testing and get that ready. So nope, not super excited. The 64bit upgrade is kind of useless with only 1GB of ram, isn't it? The top-level answer, as Mike said, is that the improvements in the ARMv8 core would make it faster than an ARMv7 core even at the same clock speed. This is a point of CPU architecture that can be a little bit hard to understand. There's also a separate set of registers used for floating-point math and SIMD operations, where a larger register is packed with smaller operands that are used together in some calculation: On the Pi 2 (Cortex-A7) there were (I believe) 16 64-bit floating point registers, and on the Pi 3 (Cortex-A53) there are 32 128-bit floating point registers. All this means that the amount of data the CPU can work with before it has to go fetch something from RAM is increased. But there's a catch: Your programs have to be compiled in a way that takes advantage of the extra registers. Code compiled to use the full set of ARMv8 registers won't run on ARMv7. It'll just crash. And code that's written to use just the ARMv7 (or v6) registers won't be able to take advantage of the register set on the A53. We went through this with the PI 2 as well, actually: Raspbian (and most Pi-specific distros, I think) was compiled for the original Pi (ARMv6), and due to the bootloader trickery that's required on the Pi, it's not always easy to substitute another distribution. It's kind of unfortunate, but taking advantage of the Pi 3's CPU enhancements isn't going to be easy. The Pi 3 will still be faster than the Pi 2, but we won't really tap its full potential unless the software we run (including the OS, probably) is compiled specifically for ARMv8. Thanks for the information. Reminds me of the analogy I heard in school. Using registers is similar to just grabbing a PB&J sandwich off the counter. Cache is similar to grabbing bread, PB and Jelly from your pantry and making a sandwich. RAM is like going to the store to buy ingredients. Registers are definitely quicker, but RAM isn't unreasonable. Oh, and going to the disk is like planting your own wheat, peanuts and strawberries! It works great for even slighly heavier use such as SDR (software defined radio) and even web-browsing on all the mainstream places that are full of videoes and pictures is no longer painfully slow. The in-built wireless is also not just very convenient but also operates on a different channel from the wired Ethernet and USB ports, so it allows for faster IO throughput. I don't like that they have changed the original "push-push" sd card reader into a friction fit, "push-pull" version, and I was concerned that I had to load a brand new image to get it running, but apart from that I still think its a pretty good little device. My concern in the long run as a developer is having to adjust things each time a new unit comes out and having no grantee that upgrading will even be possible since my work involves some pretty specific hardware features of the original Pi 2. Hopefully the Pi 3 will still do everything I need it to. I purchesed the Pi 3 for a project to put in my SUV for mobile digital communications. I paired it up with the Pi 7" LCD screen and a bluetooth keyboard/touchpad. All was easy to setup except configuring the wifi which didn't seem to want to allow me to do thru the desktop, so I did it by directly modifying files (easy instructions on the internet). The other issue is that some of the programs I am using we written with the assumtion of a taller screen for non-resizable windows. But thats not an issue so far with any of the desktop apps I've tried so far. The Pi3 performs very well with the combination of things I am using it for so far. I had tried to use the same packages on an original Pi but that could not perform well at all. I am very happy with the Pi3 and the lcd display. They are both well worth the cost in my opinion so far! This is the best Raspberry Pi so far. I bought the 7 inch touch display. Both units work great together. I used Windows 10 IoT Core Beta on it as well as Raspbian. Everything works great. Welcome to Windows IoT with this little device. Great system to work with. Faster than the Pi 2 by a factor of at least 2. Setting up the Wifi requires starting the GUI (startx). Haven't found info on how to do it from the command line (which I use). Now using "sudo halt -p" to stop it before powering down. Just unplugging it "hot" messed up the SD card twice, so now I take the time to halt it first. Great fun! Excelente product. the difference with the old versions is significant. I needes a new power supply. I've set it up as a RetroPi to play video games. Seems to work great! This is my first Raspberry Pi. But with it being the same price as the old ones and with included wifi, it seemed like a price competitive product versus the old pi's and the BeagleBone Black. I had to wait until a new OctoPrint was released for it to work, but it seems to function just great. It is mounted on my Lulzbot Mini 3D printer to turn my 3d printer into a wireless / headless machine. So i mounted the Pi 3 on the back of the 7" Display and powered it with the newer, bigger power supply. Loaded the latest version of Jessie and everything just work! WIFI configured easy and works like a champ! wish there was an external ant connection, but it's working fine now. This setup is going to control a couple of pumps (via SCRs) based on Dallas DS18B20 temp probe readings. home brewing beer and electronics! Been using these for a product I've been working on and the speed increase over the 2 doesn't seem like much, but it does make a lot of difference. onboard wifi helps setup for your less technically inclined audience if you're releasing something that runs on these. And that's really good. ... and having onboard wifi is a godsend! Works great as wireless I/F to my 3D printer! I purchased the Pi 3, SD card, and power supply from Sparkfun. Followed the directions at the link below and the Pi 3 replaced my HP laptop as the printer controller. It works great! I was surprised how easy it was to get the software on it and fire it up. The web browser works well. I am going to snag 4 for my grand children to use for web browsing. I got a cheap hdmi to VGA adapter and I am using an old monitor. Pretty much straightforward, used Noobs to install Raspbian, having some trouble bypassing the no-Flash thing so I can use to watch live streaming in my TV. The 5V-2A power source indeed generates a high-pitched noise, but only if you are less than a couple of feets away. Its not my top priority at the moment, but I set it up and made it go... No obvious issues that haven't been reported elsewhere. Raspberry Pi 3 in Pi-top works great! I purchased the Raspberry Pi 3 to go with the Pi-top kit I bought at the same time. Kit went together and worked fine the first time. This is a great way to make the Raspberry Pi portable. Love the battery life (I get about 14 hours). Great board. Works as advertised. I would recommend putting heatsinks on processor chip if you plan on running all 4 cores flat-out. (i.e. a YouTube viewer)...When teamed up with the 7" Pi touchscreen display and the Visual Studio 2015 Community edition (which is free) it makes a great development platform for Win10 IoT, Android, etc. You can develop in C, C#, VB, Python, Java or whatever your favorite language happens to be. Hard to beat it for the price. Despite some delivery issue perfectly solved by the support team, PI is just awesome. Runs perfectly the PI-top OS (modified Raspbian). Gives me a 10 hours battery computer to bring with me to the beach :). I have bought 2 pi3, because I was impressed with the 1st one. I have problems with the 2nd PI3,The software keeps saying there's no Bluetooth and there's no Wireless, tried replacing the software, Raspberrian, and updating it through the Ethernet Cable. Noobs couldn't even detect the local wifi network. I've also tried the following command. Hmmm, sounds like there might be some board issues, I would recommend getting in touch with our tech support team, they should be able to help you out! A Raspberry Pi with wifi and bluetooth is long overdue. The increased processor power makes running a graphical UI reasonably fast. I also bought the RPi LCD touchscreen which was easy to get working. I use this for all my smart house control and prototyping. You get Ghz CPU, WIFI, RAM, screen and camera interface and all is very easy to get working and cheap, the cheapest you will get. Best thing is that you can remote desktop to your smart house control unit and upgrade the software without going around the house with a laptop. Only con I found is that it has only 2 PWM which most MCUs today has, at least, 8. The previous Pi was slow and required add on technology to make it connect to anything. That is all fixed now and I find that I can use a Pi 3 for Linux work and for a workstation. I still find getting to the GPIO pins a problem as it required root access for changing them. New code is fixing this. I also still miss a real-time clock, but the Pi 3 corrects its time when it connects to a network so that is not too bad. So I would say this finally this model is the machine that was promised and is usable. I have bough some hats for Pi 3; they can fix some of the voltage issues. It is just difficult to work with the GPIO as is as voltage are very low and the chance of breaking Pi 3 are high as there is no real protection in the thing. So far the best cheap board and this version is usable and I already own four boards. Just ordered Pi-Top for two of them. So building my first Linux lap top with Pi 3. Again, finally really usable as work station. The unit was in excellent condition. It arrived with no damage and unopen. And it worked like a charm. However, I ordered this through UPS since I wanted it to be delivered quickly. But UPS informed me that an invoice is missing so that they had to delay the shipment. I contacted your customer service and they informed me later that they corrected the issue. Delivery was late. Apart from that, everything went fine. Thank you. Although it's somewhat apples and oranges to compare the OS underneath is essentially the same as I'm running Debian Jesse on both. But the Pi3 Debian uses LXDE desktop and comes with a larger number of user friendly applications. It also feels faster than the 20% processor speed difference given that the Beagle has a graphics co-processor. The ease of adding a one-wire temperature sensor compared to the Device Tree of the Beagle (which is more powerful) does lend itself better to the beginner. It took a while to get the WiFi working but once all the problems were solved it's been running headless for 3 days with an tcp server application that reports temperature on request. The code is a modification from the book "Raspberry Pi" by Bert Van Dam published by Elektor. I have a Pi2 running Octopi connected to my 3D printer. The Pi3 is running headless and will interface to a number of sensors as a tcp server with Delphi Berlin 10.1 Clients running on PC, Androids and iPads. All around a nice product. I'll probably buy a few more. With the new specs of the RPi3, which includes built-in wifi and bluetooth, this board is fully capable of doing a duty of lightweight workstation. The RPi foundation has also released and updated GUI, which takes advantage of the board fully, to include Chromium, which is a special built version of Google Chrome. I've been using this, coupled with a Pi-Top laptop kit, as my go-to workstation when I'm out and about. I bought it (Rasp 3) and a Pi-Top modular laptop kit, designed for physical computing, prototyping with bread boards, that sort of thing. The hope was to get better at java and learn python. I'll tell you the same thing i told the Pi-Top Co. It Cost me (in Canada) quite a bit more, than it should have, had I done my research. Meaning: I can by one in Canada (Rasp 3 haven't been able to find a Pi-Top ) with out the import charges, or the home land security questionnaire. THIS IS OF NO FAULT TO THE SPARKFUN PEOPLE. That and the slightly cheap feel of the key board, that is getting better with use, has reduced my review from excellent to good. Sorry spfun. people, subjective utility is subject utility even if it wasn't your fault :-). if I had know there was more than a 50 dollar import charge I might have looked in Canada a little harder. Rasp 3's can be bought from the Element14 Canada people in Ontario. But over all very happy, its a really cool little device and makes an incredibly battery efficient laptop mother board. Ten hours of solid use (writing with wifi use, lousy speller) and I still had 20% of my battery. I needed to build a fast remote monitor for an out building and this did the trick nicely. I put the camera on it and built a python script that takes a picture and sends it to me every half-hour. Much cheaper and much more fun than a commercial solution. The Raspberry Pi is a great little computing device. I bought this one to go along with the Pi-TopCeed, which is also a great device. I cannot wait to embed a few sensors into the project. The Raspberry Pi 3 is an excellent macro-computer. Great performance! I own several pi's from the zero up through the 3 and am using this in a pi-top and it is performing beautifully. It's a christmas gift and part of a larger array of stuff that will be used to teach my son (12) to solder. But it looks cool and I can't wait to dig in on this project. I have an rpi zero and a nanopi2, but this my favorite. Although the other two are great, this one is so dang fast. It really does approach the feel of a desktop. It runs node-red and nut UPS monitoring. I keep it SSH tun'd to a remote server so I can always SSH into my home network. It never breaks a sweat. I did have an issue with WiFi stability, had to turn off power management for it. That's a lousy thing to saddle a beginner with, so that is a real con. But, I'm not a beginner, so for me personally it didn't warrant removing a star. EDIT: I forgot I was also running OpenHAB and mosquitto on it in a docker container. That's how fast this thing is! Hi. Assembly was just like video, everything was there and worked out-of-the-box. It boots quickly and runs for hours. I surf, watch youtube (sometimes it lags) and develop in C & Assembly with GCC for high-end embedded ARM devices (the BeagleBone actually!). Compilation is faster than my windows laptop. I really wanted to develop ARM/Linux applications on an ARM/Linux machine. It's the future. It's my main machine now. The transition took a week, but the tools and support are all there. I'm new to the RPi, but am loving it so far and I'm enjoying learning all it has to offer. No complaints. There's nothing for me to add about how great the Pi platform is. This board worked perfectly out of the box. 10/10 would buy again. So inexpensive for what it can do and the fun you can have. Very easy to get started with the hardware and software. Lots of community and Sparkfun support, YouTube vids, articles, etc. The number of use-cases out there seems impressive. My personal objective/use-case is to connect with Pixhawk and provide downlink telemetry as well as video over cellular network. Making very good progress so far and it's a satisfying learning exercise too. Highly recommend it. setup for Pihole... doing exceptionally well. I've started a prototype with Edison board but eventually, I've realized that I need a simpler way to run Python and OpenCV code with image recognition so raspberry pi with camera module happens to be what I was looking for. Great board. These boards are static sensitive. This is my third one. First one was damaged I believe due to ESD. The HDMI port quit working even though it worked initially, and the unit ran very hot. It showed enough promise in the intended application-amateur radio, that I bought a replacement that got a lot more careful handling. I then used the damaged one at work to provide a serial source for testing an RS232 datalogger for multiple days at a time. The damaged one was quickly replaced as within a minute or two after powerup the processor would reach, and stay at, about 83 degrees C even with aftermarket heatsinks. I really should throw the damaged one away ;). Second, If you want to use both the RS232 port and bluetooth, you will have to lock the processor at a specific frequency. Really irritated at the Raspberry Pi foundation for that. Third, these things need clean power. Spend a little bit of money to get a USB cable that can handle higher current. If they experience any brownouts you are likely going to lock up the processor. What on earth possessed the Pi foundation to use a micro-usb connector to feed in power? Really poor decision for an embedded device. One thing I do like about this is it is a powerful little computer that can be powered comfortably from a lead acid battery if you are comfortable making your own 5V high current power supply. For my application I believe the average current with the display was a little bit over a half amp. I think there are brief spikes though that can go into multiple amps, however I have not verified this with an oscilloscope. On both of my operational Pis I am running Ubuntu Linux. Very quickly gave up on Raspbian due to the unorthodox way they handle UART permissions-effectively making the UART useless to progrmas like Cutecom. It seemed to also be a lot buggier than Ubuntu. On one of the Pis I have the 7" touch screen the Pi foundation sells. If you are writing your own software and user interface that is OK, but the screen elements on most other software are too small for a touch screen to be effective. Also the Pi foundation's touch screen has too few pixels for most software to display properly. Bluetooth keyboards can be a challenge to setup on Linux, good luck ;). It is best to immediately uninstall blueman if you are going to try to setup a bluetooth keyboard. So far I have found out of 2 bluetooth keyboards I have setup on Pis, that blueman didn't work at all. I have had to use a program called bluetoothctrl-a command line utility. I have been using an embedded HDMI display I bought from Adafruit for the Pi that runs fldigi (a HAM radio application) that has a higher screen resolution but about the same dimensions as the Pi foundations 7" display. I hope all this is helpful to anyone thinking of using one of these Pis in an embedded project. I bought this RasPi with the PiRetrocade kit. I showed the kids how to make a lunch box arcade with the âSparkFun PiRetrocadeâ kit (KIT-14007). The PiRetrocade kit, it is so simple anybody can do it. Only thing I would change on the PiRetrocade kit, the connector are too big for those small wires. Yeah, I go back always in playing with ~Zap~. Built my first Radio in 1957. I Worked in the Army when they got their FIRST IC transceiver in 1969.
although i didnt buy a proper power supply at first, im running my pi3 off of an old atx power supply, which has more than enough juice. love the pi3, still playing with the pi1's, of which i have 3, ill probably pick up another 3 at some point. only thing i wish i had a uk version. also, heatsinking the 3 is a good idea, and was a fun project in and of itself. enjoy!!! What can I say, an rpi with wifi ... awesome. As with all pis, performance is linked to the quality of the sdcard ... so pick one with a fast transfer rate. I'm not going to advertise for anyone here but there are sites that provide comparative reviews of sdcards that are very helpful. For such a low price, the Pi has great specs and performs wonderfully. You need to know Python to get any specialized performance out of it. However, it does work great with the default settings too! My advanced Computer Science students are having a great time building self-directed final projects using the Pi3. I absolutely love it that I ordered one for my 7yr daughter. I've only had it a few weeks, but so far, great! I have six Raspberry Pi B (the old ones) that I have used and tested for several years. The Ras Pi 3 was purchased with two things in mind: 1) see how much faster the Pi had become; 2) try to use the Pi 3 to set up the SD card for use in a Ras Pi Zero W that I also bought. The setup with the Pi 3 and Raspbian Jessie (Desktop version) went very smoothly. Everything that I tried worked well. The Pi 3 is MUCH faster than the Model B and worth the money with builtin WiFi and Bluetooth. Anyway, I left all settings as they were, shutdown the Pi 3, removed the SD card and inserted it into the Pi Zero W, which was setup to run headless. The Zero W came up without any issues. Dmesg didn't show any problems. So, I ran a few tests using Putty and all is well. Why did I do it this way? Well, I didn't want to buy all those extra cables for the Zero W which would end up costing much more that the Zero W alone. Great products. Thanks Sparkfun. Kiosk Systems, Webservers, Laptop (Pi-top), Teaching, Robotics, this thing does it all and more. I would have loved to have one (or five) of these growing up! I am pleased with my Pi 3. I purchased it with a standard black case and power supply. Just under $60 with shipping for the whole thing. I already had the SD card and downloaded the boot/start-up image from the internet. I had zero problems getting up and running. I borrowed a HDMI monitor from my son and added a low cost Logitech wireless keyboard and mouse combo for less than $20. It works very well for Python projects, internet browsing and comes with LibreOffice software There are many online blogs and other sites to help you if you get stuck. The Raspberry Pi 3 was easy to set-up as my 3D printer server. Downloaded OctoPi/OctoPrint, flashed the microSDHC card, configured the wifi, inserted into the PI, and powered it up. It booted, accessed the network ran immediately, and I could access it. I've now got a 3D print server working. Easy-peasy especially with the on-board wifi. Substantial increase in performance. Out with the old in with the new! Currently using it as a climate controller for various pet projects. Device was everything I expected out of it. The only issues I am having (None of which warrant a reduction of a star for me) as as follows. No 5 Ghz wifi support, and in a crowded area that is resulting in ~0.4% packet loss. Outside of those things? I am in love with these little guys. When my smart thermostat dies, i fully plan to replace it with a Pi. They can easily host their own web server with a comfortable amount of traffic for home projects, which means they are just about perfect for me. GPIO is very simple to do, as long as you appreciate that you are not running a Real Time OS. Know your limits, and have fun! A joy to use a computer that works! I still get a smile on my face each time I boot up that little circuit board and a full featured computer pops up on my screen. The wifi is humming and it is ready to go. I learned python on it and have programmed up the displayotron to make a portable music player. Another pi is driving around on the floor, chasing the cat. After 20 years in the desert of MS Windows we have our PERSONAL computers back again. Great for home automation. Get a bunch of these and have them doing different stuff around the house. Check out the videos online where people are using Node-Red for various automation projects. Also not that bad for a PC. Boots up pretty quick. Just don't open too many tabs in Chrome! This board is the perfect companion for the great RetroPie application, that emulates most old-style arcades and home computers (MAME, SNES, GameBoy, Genesis, C64, Amiga, etc.). It's integrated WiFi and Bluetooth capabilities make it very easy to configure and setup. WiFi connectivity allows to remotely copy ROMs using RetroPie Manager, and Bluetooth enables using PS3/PS4 controllers wirelessly. Using small TFT LCD screens (2.8" to 3.5") is also supported. Great little board with plenty of options you can do with the thing. Iâve heard a lot about the raspberry pi, but when I received mine and began tinkering with it I found this latest version to be a great pice of hardware but the support for it is amazing. There are all kinds of cool things I can do with this board and all it takes is switching out a micro SD card. You guys are the best online shop for prototypers. What's best for me is that I have my equipment within a week at my door step which takes the same time as if I would have ordered it locally in South-Africa. Way faster than the raspberry pi 2. And With wifi and Bluetooth on board this little gem opens up a ton of possibilities! I just wish I had more time to play with it. Spark fun sent the unit at A great price and I got it fast! Having so much fun and learning a lot! There's so much power in this tiny computer it's amazing! I installed Raspbian Stretch LITE on Raspberry Pi 3 to build a Single Channel LoRa gateway. Also a single channel packet forwarding software. Both are working well. Great performance. I highly recommend this to anyone. It's an even better Raspberry Pi! I already loved the Raspberry Pi but this one is kinda sick. The built-in WiFi makes this super convenient and I'm looking forward to playing with the Bluetooth capabilities as well. Just get one already! Everything works so much faster now! Great speed upgrade for the Pi. 64 bit cpu really helps. Just waiting for the Bluetooth to work and the WiFi to configure correctly. It's awesome having the extra speed (1.2ghz), the WiFi and Bluetooth built in!!! I love this thing! !